Researchers from Monash University in Melbourne, Australia, conducted a study which was published in the Asia Pacific Journal of Clinical Nutrition, whose findings showed that the daily intake of a single gram of turmeric can lead to short-term memory improvements in people predisposed to memory loss. This amazing root has been used as a natural medicine and delicious spice for thousands of years and is one of the crucial components in the traditional Asian cooking and medicinal systems. The golden color of turmeric comes from the presence of “curcuminoids”, and curcumin is the most important among them. The recent Australian study involved adults over the age of 60 who had recently been diagnosed with pre-diabetes but were not receiving treatment. Researchers analyzed their working memory, as diabetes is linked to memory loss. They received white bread and supplemented with either 1 gram of turmeric or a placebo for breakfast, and scientists tested their memory both before the meal and after it. Nowadays, conditions like dementia and diabetes are on the rise, so any possibly effective natural intervention early after their diagnoses can do miracles for the health of the patient. 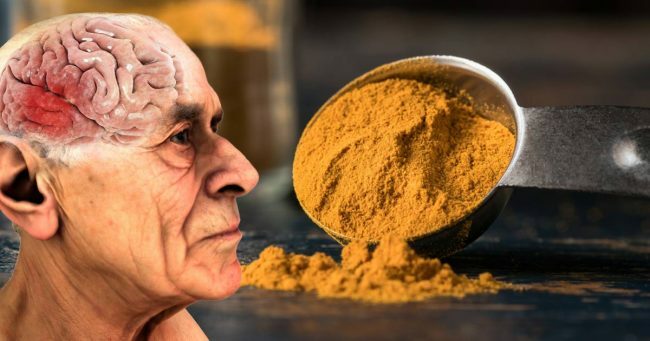 Curcumin has been linked to a lower dementia risk numerous times before. According to a 2009 study done by researchers from Duke University, it causes brain changes and reverses some of the effects of Alzheimer’s disease. Namely, it targets the amyloid plaques, which are considered to be one of the main causes of brain damage. The active ingredient of turmeric, curcumin, is responsible for most of its medicinal and healing powers, since it is full of antioxidants and offers extremely powerful anti-inflammatory properties. “Arguably, the most powerful aspect of curcumin is its ability to control inflammation. Moreover, this amazing spice improves health in a thousand other ways, cleanses the blood, prevents premature aging, detoxifies the liver, prevents free radical damage, improves skin health, and much more. Also, a series of 2013 studies done at the University of Tsukuba in Japan showed that curcumin improved two measures of cardiovascular health as much as aerobic exercise did. Also, numerous studies have confirmed that turmeric and curcumin will help you soothe arthritis, reduce body fat, prevent cancer, and improve cancer prognosis. “ Curcumin actually has the most evidence-based literature supporting its use against cancer of any other nutrient, including vitamin D! As noted by Dr. William LaValley, curcumin is unique in that it appears to be universally useful for just about every type of cancer. This is odd, considering the fact that cancer consists of a wide variety of different molecular pathologies. One reason for this universal anti-cancer proclivity is curcumin’s ability to affect multiple molecular targets, via multiple pathways. Once it gets into a cell, it affects more than 100 different molecular pathways. And, as explained by Dr. LaValley, whether the curcumin molecule causes an increase in activity of a particular molecular target, or decrease/inhibition of activity, studies repeatedly show that the end result is a potent anti-cancer activity. Although it is a well-known fact that the combination of a healthy diet and regular exercise effectively prevents disease, adding turmeric to your diet will improve health in multiple ways, and help you prevent dementia. You can start eating curry much often, add turmeric to your salads, rice, and quinoa, or prepare turmeric latte or tea. There are also some delicious hot chocolate recipes that contain this tasty spice, add it to soups and smoothies, or take it in a supplement form.